Memorial Day is a Monday holiday, and we decided to proceed with a Cornbread Supper for any people not tending their own backyard grills. About 25 people came to Supper, bringing several red-white-blue dishes: fruit salads, casseroles -- and a golden roast chicken. Prepare for Savory Cornmeal Waffles - taste treat coming up on Monday night, June 8! 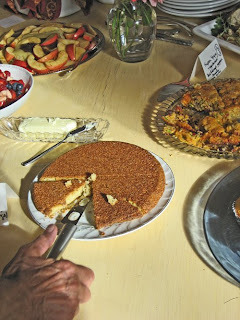 Campsie Cornbread Suppers: The Recipes!